The Greenland Inland Traverse (GrIT) team has left the crevasse zone and is headed to Camp Century [about 150 miles from Thule Air Base]. The GrIT team has been fighting weather and poor snow conditions the whole way. They had another stalled day in a Condition Charlie storm, sitting tight and waiting for the winds to die down. They’ve also had to deal with the worst sastrugi they have ever encountered in this area. These long wind rows of blown snow are 5-6 feet high, creating a rough passage through this zone as the tractors climb one side and then descend the steep back side to cross over. The custom-built sleds are suffering as well. The weight of the cargo loads cannot be distributed evenly across the airbeam/pouches, causing wear and failure of some of the pouch attachments to the decking. In addition, on the descent of one sastrugi, the two fore decks were pinched too closely together, so the helium cylinders on the front right deck got too close to the WeatherPort tent on the front left deck and tore a hole in the tent side. This WeatherPort is the only covered shelter for materials and work space, so a new hole will allow more snow and wind to penetrate this area. Our team has been able to do the direct science support tasks planned for this part of the trip. They retrieved a data card from an instrument site installed in 2014 by Zoe Courville's team for SAGE, an NSF-funded study of sunlight absorption and firn compaction. Data from this and other SAGE instruments, retrieved and forwarded to the researchers, will be used for modeling and analysis. The Arctic Research Support and Logistics Program within the National Science Foundation’s Division of Polar Programs funds the GrIT. 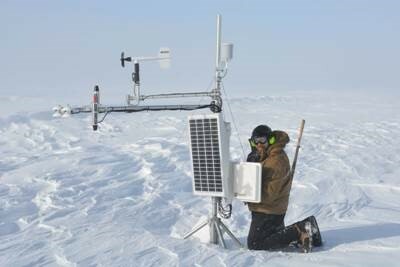 CH2MHILL Polar Services and Cold Regions Research and Engineering Laboratories are working together with the NSF to develop the traverse infrastructure and route to Summit Station. The 2016 spring traverse delivers cargo to Summit Station, and continues efforts to optimize mobility, GrIT will provide direct science support to several projects, retrieving instruments for a soon-to-be-completed effort, and laying fuel caches for upcoming projects. Follow GrIT’s progress here: http://datatransport.org/grit.